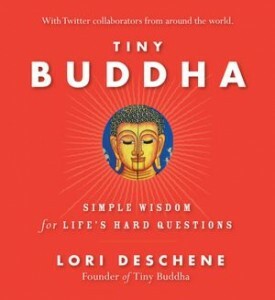 I am grateful for having found this blog and, consequently, Tiny Buddha. I’m grateful for my husband and kids who love me no matter what- evev if I’m in a bad mood!! I am grateful for having my family. My family is my life and I am nothing without it. I am grateful for my wonderful wife and family and the peace the God brings me! I am grateful for the existence of an online network of thoughtful caring people and for both the means and time to be in contact with them. The gratitude I feel today is abundant – The sun is out on a crisp December morning. I have spoken with many dear ones who make me smile and I return the favor. I am grateful that I can feel the love in my life. I wish that for all the world. I’m grateful for the chance to have a quiet day and much needed rest. I am grateful for all the changes in my life. It’s been a rough year for me, but nevertheless, all is going to be good. I’m grateful for my warm bed, fridge full of food, and the ability to read, type, and comprehend. I’m so grateful for getting a second chance, thanks for the giveaway. The interview for this book has touched on all the questions I have about meditation and the different styles. I cannot wait to read it! It seems to have brought all the information I have been seeking together into one book. Wonderful! I am grateful for waking up. I am exceedingly grateful this weekend for the fact that feelings and internal moods can shift from hard to gentler in the space a day, an hour or even in minutes. I am grateful for my husband and daughter, who fill my days with laughter and fun. I am grateful for slowly but surely learning how to maintain the fine balance of good mental health by challenging assumptions + living life uninhibited. Consequently, I am so very grateful to be in a healthy, realistic + positive mindset this morning instead of in the abyss of utter despair. Today I almost was involved in a serious car accident. I was in a trailer with by beloved bike and two best friends. We where catching a lift up to the top of the hill, to proceed and ride down a secret trail. Something that I love doing. We where almost hit square on, by another driver who was doing what he loved, driving fast, dangerous yet in control. Luckily for us he had the skill to slide and swerve, barely missing us before speeding off. I am grateful that he was a skilful driver and that also, if something was to happen it would of occurred at a place special to me. I’m grateful for the internet and the opportunity it provides for me to learn from the great thinkers and thought provokers. It feels limitless. I am grateful for my amazing wife. I am grateful for the opportunity to live clean and in today, that I no longer obsess over tomorrow. I am grateful that I can enjoy my life due to the gifts I’ve received, one of which being a relationship with a god of my own understanding through meditation. I commonly meditate by saying the serenity prayer, laying still and thinking in conversation with a loved one, asking for help in areas of distress in my life. I enjoyed reading in your article that there are many ways to meditate, it just depends on the stillness of the mind. I often find I get the same ‘free’ ‘serene’ feeling from drawing abstract designs in pen and ink, writing reflective poetry, yoga, singing, and at the close of meaningful conversations. I am grateful that I am able to feel the real-ness of the things today without the obstruction of drugs or alcohol in my life. Today I am grateful for great books that let you get lost in the story. . . and time to read. I am grateful for the book that I am about to win! I am grateful for everything coming together for me this year so I could lose 23 kgs and be as healthy as I can be. Love it. I am grateful for new and different perspectives that challenge me to think and learn and therefore help me establish a worldview that is not based solely on my limited life experience. Thanks for the review. Sounds like a great book – I’ll definitely check it out. I am grateful for my health and my family’s health. I am grateful for the food in my fridge!